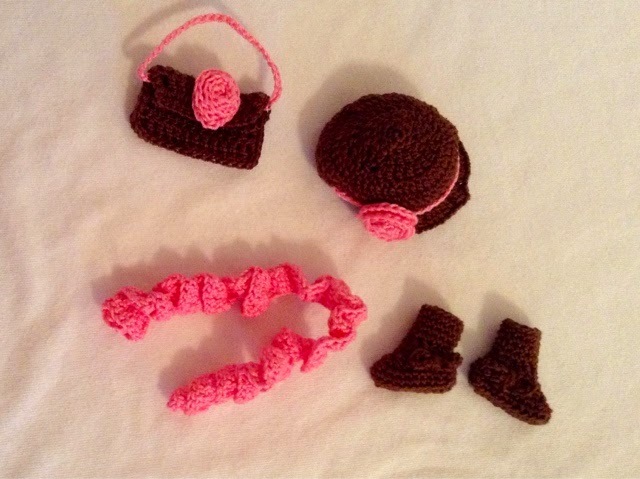 Here are four super easy patterns for some cute fall accessories for Barbie. There is a pretty, fashionable ruffle scarf, a warm newsboy cap, a cute purse, and some cozy boots. 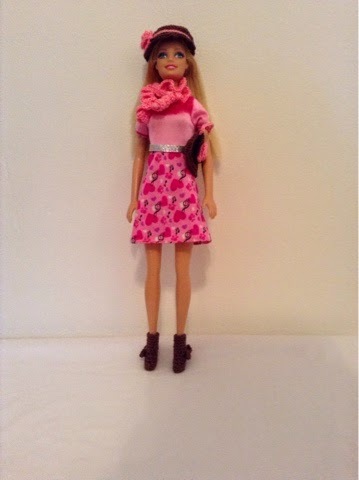 It only took me about an hour and a half to make the scarf, hat, and purse, and about half an hour to make the boots. So, about two hours total to make these four accessories. 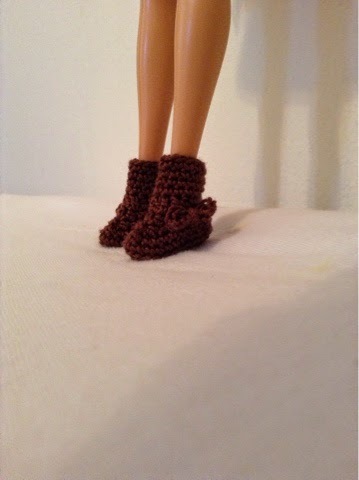 Aren't the bows on the boots so cute?! Row 1: Ch 79, 2 tr in 5th ch from hook, 3 tr in each ch across, 3 sl st down side of last tr. Fasten off. Weave in all ends. Rnd 7: Ch 3, (1 dc in each of next 4 sts, dc dec in next 2 sts) around, join, turn. Rnd 8: Ch 1, (dc dec in next 2 sts, sc in next st) around, join, turn. Rnd 9: Ch 1, 3 sc in 1st st, 3 hdc in next st, 3 dc in each of next 4 sts, 3 tr in each of next 4 sts, 3 dc in each of next 4 sts, 3 hdc in next st, 3 sc in next st, sl st in next st. Fasten off. With French Rose, sl st into st before the last st in row 9, ch 30, sl st into st after last st in row 9. Fasten off. Row 1: With French Rose, ch 18, 2 dc in 4th ch from hook, 3 dc in each ch across. Fasten off. Arrange so that piece curls into a circle. With tail ends, sew flower together so that it will stay in place. Sew flower onto LEFT side of hat. Row 2-? : Ch 3, dc in each st across, turn. Repeat until piece measures 2 inches. Do not fasten off. Fold piece into shape of a clutch (don't forget the flap!) Sc up flap, sc one set of sides of the purse together, 3 sc in last st, sc across bottom of purse, 3 sc in last st, sc other set of sides of purse together. Sl st to ch 3 of last row. Fasten off. Make 1 spiral rose. Sew to middle of flap. With French Rose, fasten on end of last row. Ch 30. Sl st onto other end of last row. Fasten off. Weave in all ends. Rnd 1: Ch 10, sc in 2nd ch from hook, sc in each ch across, 3 sc in last ch, turn piece so that you are crocheting in bottom ch loops, sc in each ch loop across, 3 sc in last ch loop, join to 1st st.
Rnd 2: IN BACK LOOPS ONLY, ch 1, sc in each st around, join to 1st st.
Rnd 3: Ch 1, 1 sc in each of next 7 sts, (sc dec) 2 times, 1 sc in each of the next 7 sts, (dc dec) 2 times, join to first st.
Rnd 4: Ch 1, 1 sc in each of next 5 sts, (sc dec) 3 times, 1 sc on each of next 5 sts, sc dec over last 2 sts, join to first st.
Rnd 5: Ch 1, 1 sc in each of next 4 sts, (sc dec) 3 times, sc in each st to end of rnd, join to first st.
Rnd 6: Ch 1, 1 sc in each of next 2 sts, hdc in next st, 1 dc in each of next 5 sts, hdc in in next st, 1 sc in each st to end of rnd, join to first st.
Rnds 7-10: Ch 1, sc in each st around, join to first st. Fasten off at end of rnd 10. Gather back of boot slightly. Row 1: Ch 6, sc in 2nd ch from hook, 1 sc in each st across, 3 sc in last st, turn so that you will crochet into bottom ch loops, 1 sc in each of bottom ch loops, 3 sc in last ch loop, join. Fasten off. Gather middle of piece. Sew to outside side of boot. I LOVE the hat and boots! Great work!